I just wanted to post a picture of our 3 boys taken on a day out last summer. 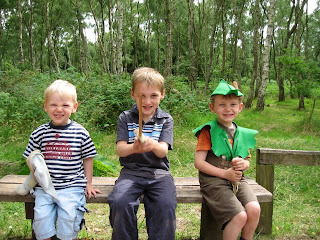 We decided on the spur of the moment to jump in the car and visit the Robin Hood Festival at Sherwood Forest. It was one of those days that you don't plan, and because of this was all the more enjoyable. We missed the jousting display (didn't fancy waiting around for 3 hours in order to get a good view through the crowds), but the boys loved the medieval story-tellers, the gift shop, and even had a go at archery! Bath Time Party Bags now in!